The fields of narcissi just outside of Céreste are in full bloom, so I have bunches of them in the house, the smell is divine! I posted photos of them on my Facebook page, I think you should be able to see them if you click HERE even if you’re not on Facebook. 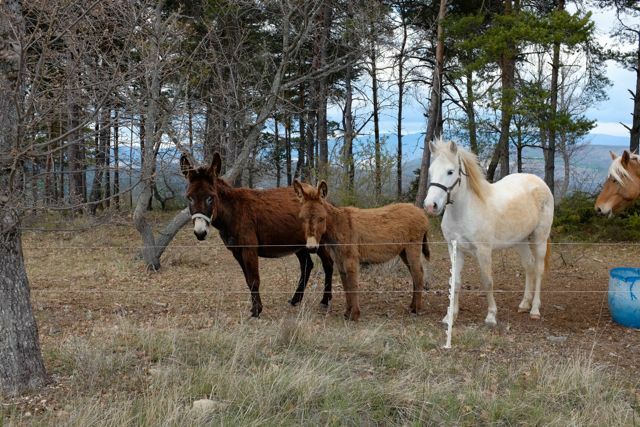 Anyway, to horses… can you imagine my shock when I arrived up to the farm the other day and found THIS?? 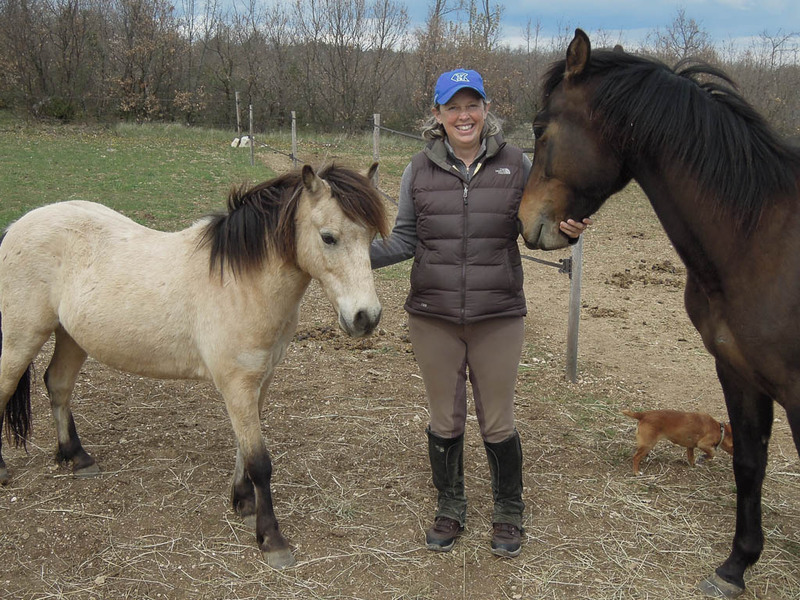 Has all that rain finally caused my little dun horse to shrink?? Or has Flurry been working hard in a secret laboratory hidden behind his field shelter and did he finally succeed in cloning himself, to produce a Mini-Me? 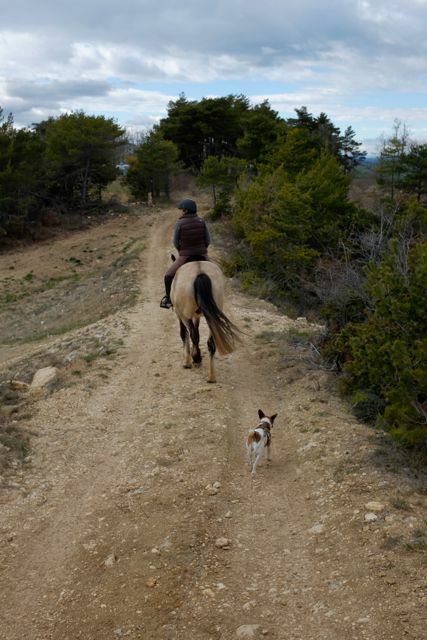 Thankfully, I found the real Flurry shortly after and we went for a Dog Edification ride. We’re still trying to get Cookie used to the horses. 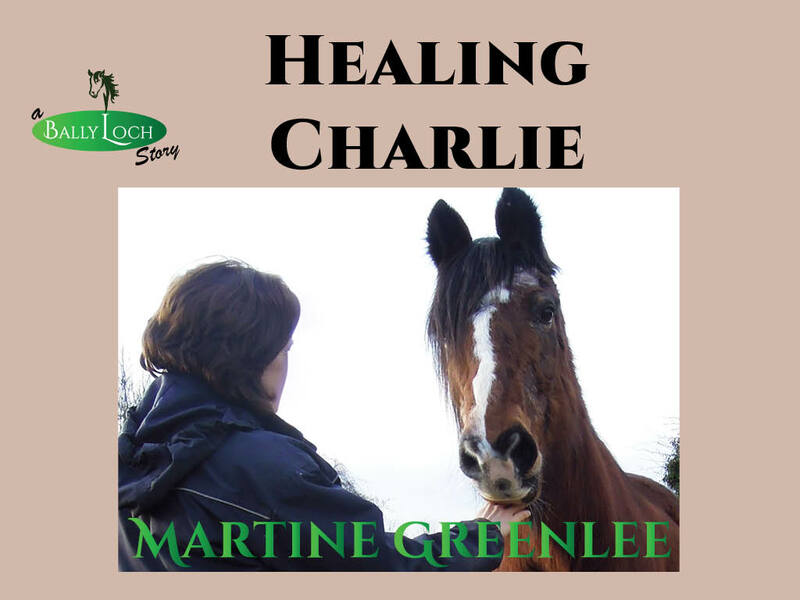 She’s getting better, but every so often she has a go at them – a bit of a bark and a growl. 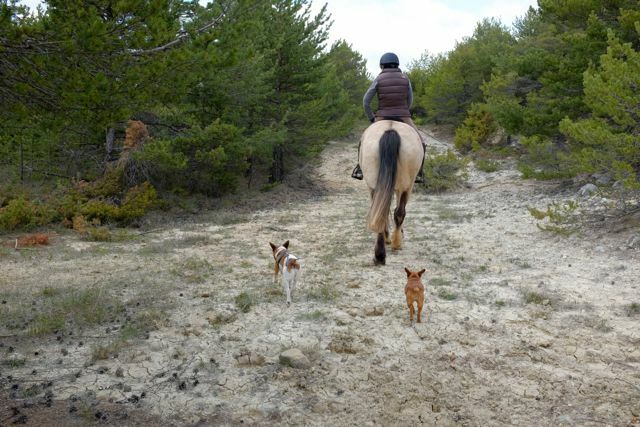 She was great on the ride, only had one little hissy fit near Flurry’s hind legs and the rest of the time trotted contentedly behind (on the retractable leash, of course). Maybe this time next year she’ll be a trekking dog, you never know. They’re in a newly-fenced off area at the back of the Farm. Aero nearly died with excitement the first time we met them. So did I (but not in a good way). Flurry is really good with the Long Ears-es now, even when they bray. Cookie wasn’t too impressed with these at all, and kept telling them to go away, in dog language, but they took no notice of her, which was good. 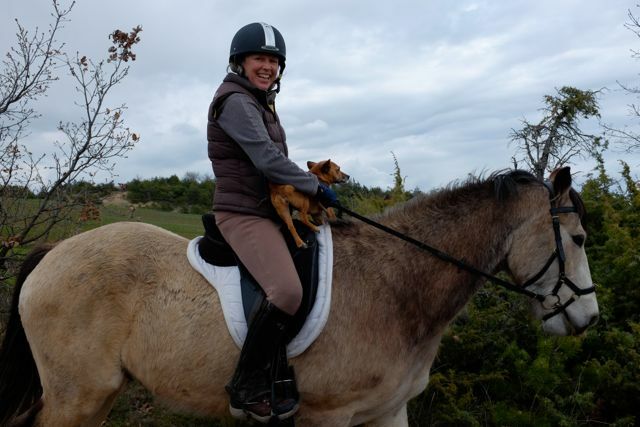 A little later, Flurry agreed to give Cinnamon another riding lesson. She’s a bit nervous. If she was human, she’d be one of those beginners who hunches up into the foetal position. I suspect this will never work and we will have to leave her with her dog-sitters when we go for long treks. 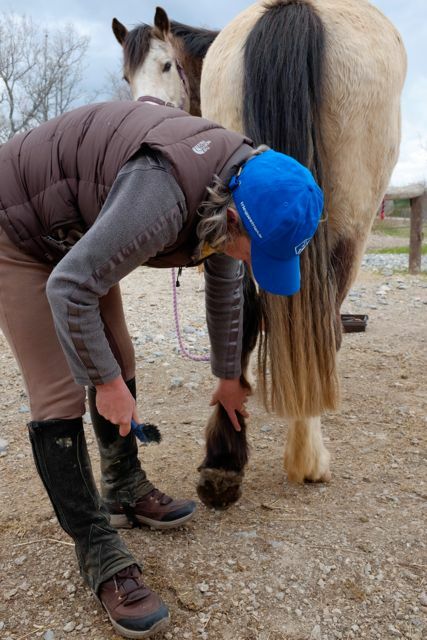 The horses’ feet are drying up and hardening now that the rain has gone and they are both noticeably more confident barefoot on rough ground. There is a lot of dry, flaky frog to chip off and I’m hoping that when it’s all gone there’ll be lovely healthy frogs underneath – fingers crossed! Aero’s hind feet have gone DOWN a size in boots – thank goodness I didn’t sell his Size 2 Renegades! 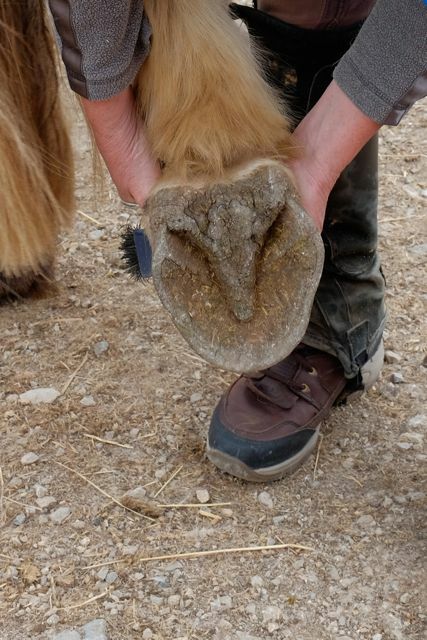 Hoof trimmers, is it possible that their feet expand and contract with depending on the amount of moisture they’re exposed to? Or is it more likely that the flare on his hind feet is growing out? They’re getting a few hours of grass every day now, and I think it’ll only be a matter of weeks before they have that glossy, summer look, especially Aero whose coat has been looking a little rough. 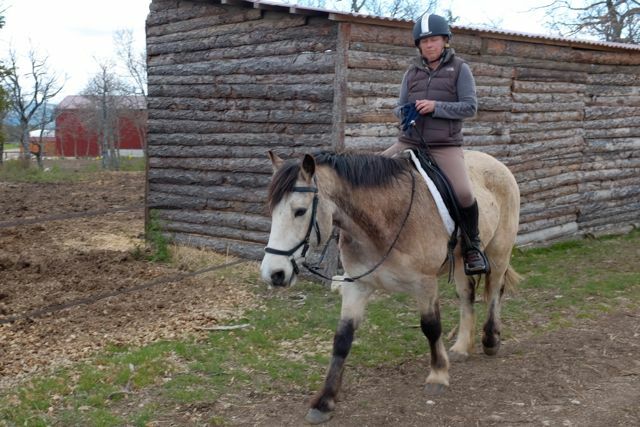 Finally, a gratuitous Happy Me & Flurry picture. I ❤ this horse! I want a mini Flurry! How cute is he?! 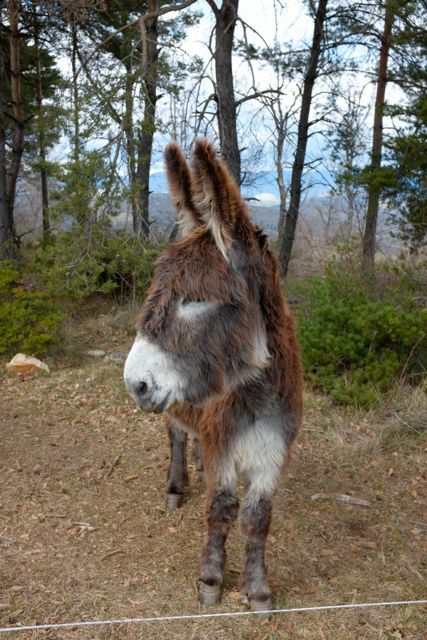 And I love that picture of the donkey, he looks like he is not having any of it! What a great collection of photos. Beautiful creatures in all directions! Love that Mini and all the neighbors. Mini me is adorable. I think think the dogs will get it after a while and be happy to be trekking dogs. Love all your pictures. I’ll bet it is just beautiful there. Nice to get to meet the long ears and that mini Flurry is awfully cute. As for Aero’s feet shrinking, I’d say it is because the flares are growing out, which is a very good thing. That frog looks fantastic. The ground is so wet and soft here that we never see anything that well developed. Thanks for the input. I think you are right about the flares causing the change in size. I was looking closely at his front feet today, the angle of growth is changing and I suspect when the new growth comes down he might come down a size in front, too. It’s really interesting, you can see an “event ring” on all four feet which corresponds to when he had the prolonged abscess last year. Then there’s another ring which I suspect is a “mental/physical trauma” ring from the move – I think it corresponds, time wise. When the abscess ring grows out, in two months max I would say, his feet will be at a different angle. Mini Flurry is too cute! 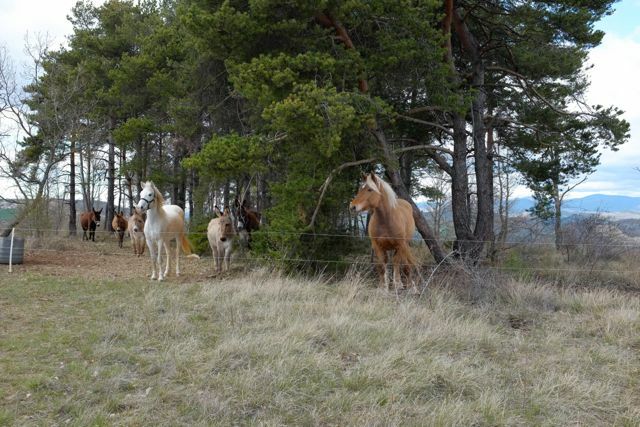 And that one horse looks like a Haflinger! Love the donkeys!! 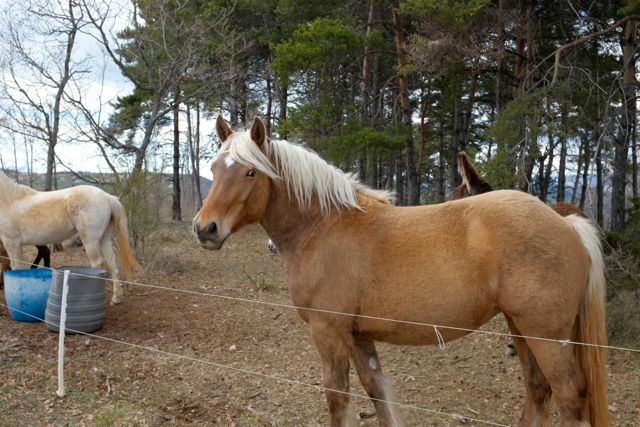 I think the Haflinger-ish horse is a Comtois. They are bigger and stockier than Haflingers – have a Google and see!